JUSTIFICATION of the method of selling rugs by auction has been offered in many forms and phrases. It is perhaps best expressed somewhat thus: Every number has a certain intrinsic value, and that is a basis price at which it should sell. But beyond that it may have an extra value, which, like beauty in general, is in the eye of the beholder. The beholder, therefore, who sees a rug to covet it should name his own price for it. It may be one of the specimens he lacks in his collection; it may fit this corner or that. Anyway, it is worth more to him than to the lower bidder. Incidentally, the seller and the auctioneer gain the fair profits of competition. Other arguments in favour of the auction have been advanced by the head of a great department store. His opinion is that the auction gives every one a chance to get the rug desired at a fair price. Tastes differ and prices differ, but the average of an auction is fair to both buyer and seller. Regardless of theories, rug auctions, by whomsoever fathered or sponsored, thrive and flourish. If the auction be the collection of such and such an Oriental, whatever his name, there will be a great deal of cheap stuff in his stock, and there will also be many choice pieces which he holds as the apples of his eye. He buys from the wholesaler so many bales at so much per bale of say twenty pieces. In the bales of ordinary qualities the several items will average about the[Pg 109] same. But in the more expensive bales there is a good general average, with a few prizes added. They are like the two or three green firecrackers in the packs of our childhood. These special pieces in the high-priced bales give the seller his legitimate opportunity and profit. If these odd firecrackers please your fancy more than mine, and I am contented to choose the conventional red ones, it is for you to fix the value of the greens. “The wife. Look at this splendid bargain I bought for twenty dollars to-day. It’s worth two hundred. “The husband. Indeed! How do you know it is worth that much? A new plan of auction has been recently tried. You may buy in one or more lots at your own price, and if you do not wish to keep any, they may be returned within a certain number of days. You may bid ad libitum, recklessly as you choose; and if your choice be not all that your fancy and electric light have pictured it, you are under no obligation to keep it or pay anything on it; you may elect to change your mind and send it back. How this plan works in practice and finance has yet to be demonstrated. It would seem to be all on the side of the buyer and against the seller, who must lose many a bid from a bona fide purchaser at a lower figure. The matter of human nature doubtless figures in the problem, because there is some little feeling of shame about returning an article bought in under competition, no matter what the guarantee may be. As to the auctioneers, they are always glib of tongue, good-natured, and persuasive. That they are not canonically and absolutely truthful is perhaps not their fault. They certainly cannot know more about rugs than the few authorities who have made a study of the subject; and, as said before, they are generally prompted by the “consignor” of the collection. If only they would not call every rug an “antique and priceless specimen,” their individual consciences might be happier, and their audience less bored. However, no matter what the audience, or how small it may be, there are always some there who will appreciate the difference between a four-dollar and a forty-dollar offering, and bid up the former to seven dollars and the latter to thirty dollars. Thus the auctions go merrily on and strike a general average. The skilful auctioneer will feel the pulse of his audience with a quicker touch than the most renowned of doctors; and once assured of their class and position, wealth and condition, and what grade of merchandise they are willing to buy, the game is in his own hands, provided only that his audience is large enough. He should have at least a regulation pack of fifty-two in order to do justice to his own hand and skill, and in order to play off one card of his audience against another. The auction has its own particular fascinations, and its own habitués and devotees in every city. The chronic attendants should be the most careful and conservative of buyers. But the artful auctioneer soon learns to know them, to recognize them among his clientèle, and to humour their whims, moods, and fancies. Sooner or later he will wheedle them into a bid against their better judgment, and then make good capital of the fact that such and such a connoisseur had bought so great a bargain. The question might be asked, impersonally and perhaps impertinently, What was the auctioneer’s influence at the Marquand sale? Was his the power? Was it due to the catalogue? or was it in the air; and the zeal of an eager audience? The retail trade in rugs throughout this country is largely in the hands of Armenians, both fixed and peripatetic; but of recent years much of their business has been annexed by the department stores. These various Armenian dealers are universally known for their shrewdness and cleverness as well as for other ingenuousness and natural courtesy. Except the heads of the carpet departments in some few large concerns, they know much more about their wares than other salesmen, and their personal, live knowledge gives a fillip of enthusiasm to the purchaser. They would control the retail trade in rugs, were it not that the department store has[Pg 114] brought against them its powerful weapon of per cent. The store asserts that it wants only its modest per cent on the cost of any article, no matter what its sentimental value may be. This may not be truth in its stark nakedness, but it has availed to draw to them a great deal of the trade in Oriental textiles. The wholesale dealers are the most important factor in the question of distribution, for almost all the rugs sold in the United States must first pass through the hands of one or another of a dozen New York princes of the market. Large or small retailers may import some pieces directly from London, Paris, or Constantinople, but even the most important retailers buy heavily from the great Armenian wholesalers in New York City. It is difficult to estimate and impossible to state absolutely the number or even the value of the Oriental rugs annually imported into the United States. The reason is that in the reports of the U. S. Treasury[Pg 115] as to “Imported Merchandise,” etc., Oriental carpets and rugs have no separate classification, but are included under the general heading of “Carpets woven whole for rooms, and Oriental, Berlin, Aubusson, Axminster, and other similar rugs.” It is quite a mixed company, but Oriental weaves as herein considered are at least distinguished as such, and differentiated from carpeting by the yard. They have also the distinction, with the others of their group, of paying a tax of ninety cents per square yard and forty per cent ad valorem, as against from twenty-two to sixty cents per square yard and the same forty per cent ad valorem for the various Brussels, Wilton, and Axminster floor-coverings coming by the yard, and not in one piece. And the duty on Oriental rugs, be it observed, is measured by the square yard, and therefore no record is kept of the number of pieces, or how many individual items of the four classes have been imported. Nevertheless, the statistics for the year ending June 30, 1902, show this general result: The total value of that year’s import of these “whole carpets, Oriental, Berlin,” etc., was a trifle below three million dollars. Two and a half millions of this value came to New York with only half a million left to divide between Chicago, Philadelphia, Boston, San Francisco, and other ports of entry. The supremacy of New York City as the Oriental rug mart for this country is easily manifest, although it is not so easy to estimate what proportion of the two and a half millions of value was in Oriental rugs and what in modern carpets. One expert figures the value of the Oriental rugs imported that year into New York as more than half the total, or perhaps two millions. It is as fair an estimate as may be had. Considerable as this amount may be, it seems much less than might be expected. It may perhaps indicate the cheap grade and low quality of most of our present acquisitions in this category. 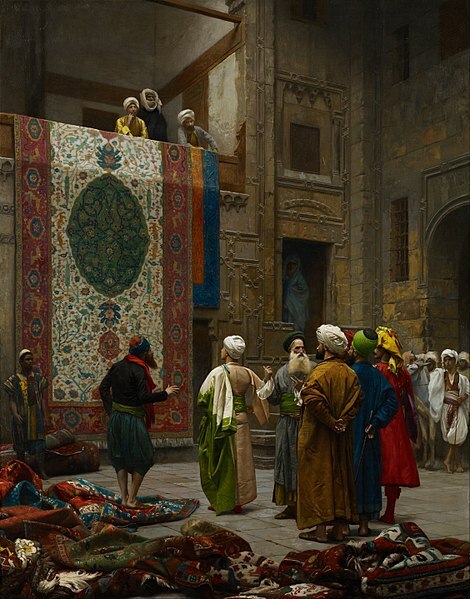 The gathering of the rugs by the buyers, in the first instance, involves great hardships, endurance, and even danger; and the deeper their incursions into new and strange territory and unopened and unexplored sources of supply, the more profitable their spoil, but the greater their toil. Beluchistan, as previously suggested, would appear now to be one of the remotest regions yet remaining to yield up a few new treasures to the persevering buyer. These rugs so gathered to the centres of trade in Constantinople, Tiflis, and other distributing points, quickly find their way thence to New York, and help to make the magnitude and seeming wonderful complexity of the large wholesale depots. Whoever is fortunate enough to have the entrée to any of these great New York storehouses will be first among those who understand the importance, value, and appreciation of the Oriental rug. « Oriental Carpets, Saddle-Bags, Pillows, etc.